A quality replacement turf tyre to fit the rear wheels of Countax C Series, Countax K Series and Westwood S and T Series garden tractors. Size is 18x9.5/8, 4 ply tubeless. Please check the size of the rear tyres fitted to your mower carefully before ordering. 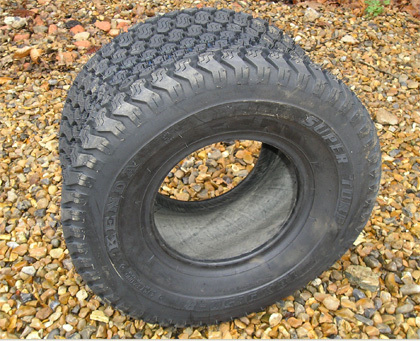 If you have any doubts about size or suitability of this tyre, please telephone us on 087 0224 4202 for advice. We have supplied at fitted Kenda turf tyres to garden tractors for several years and consider them a good quality excellent value tyre. We are able to supply turf tyres to fit all types of domestic and professional garden machinery, if this is not the tyre size you need, please contact us with full details of your requirements and we will respond with a quote. Delivery of this item is FREE to mainland UK addresses (Highlands and Islands extra). Normally in stock for despatch within 24 hours of order, please allow 1-4 working days for delivery.